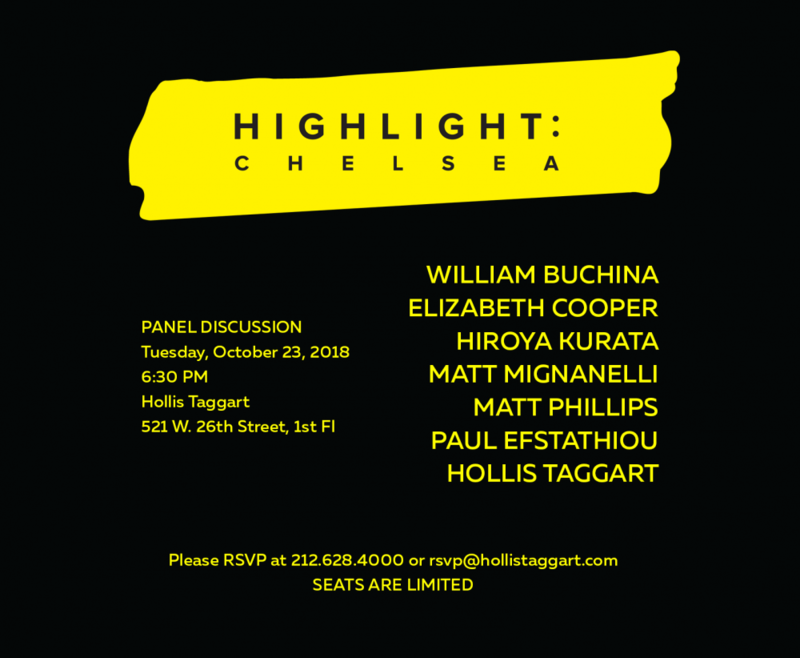 Please join Hollis Taggart for a panel discussion with contemporary artists William Buchina, Elizabeth Cooper, Hiroya Kurata, Matt Mignanelli, and Matt Phillips, developed in conjunction with the gallery’s current exhibition Highlight: Chelsea. Moderated by exhibition curator Paul Efstathiou and gallery founder Hollis Taggart, the discussion will explore the development of each artist’s practice and the formal and conceptual inquiries that guide their work. The panel discussion will be followed by a reception at the gallery, providing additional opportunity to engage with the artists, curator, and gallery leadership one-on-one. The event is part of Hollis Taggart’s expansion of its contemporary program, in line with its vision to provide a platform for emerging and under-recognized artists. Additional information about the participating artists and Highlight: Chelsea follow below. Highlight: Chelsea features new and recent work by thirteen emerging and mid-career artists that together underscore the formal and conceptual diversity of contemporary practice. Highlight: Chelsea is guest curated by Paul Efstathiou and marks the gallery’s second collaboration with the independent curator, as it expands its contemporary program. The exhibition includes new work by William Buchina, Elizabeth Cooper, Corydon Cowansage, André Hemer, Hiroya Kurata, John Knuth, Matt Mignanelli, Matt Phillips, Esther Ruiz, Eric Shaw, and Devin Troy Strother, as well as recent works by Marcel Dzama and Brenda Goodman. Highlight: Chelsea emphasizes the featured artists’ distinct styles and approaches, while also creating dynamic aesthetic juxtapositions and parallels between them. Highlight: Chelsea is on view through October 27, 2018.